Chain Block is a simple manual lifter using puley (roll), gears, chain (chain), and hook (hook block). This tool is relatively small and suitable for different types of lifting. The lifting load of a chain block may range from 0.5 tons to 50 tons. 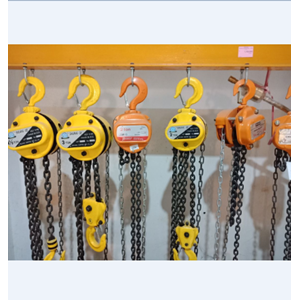 Generally used for low lifting and can also be used with hand overhead cranes, fixed hoist cranes with small single rails and others.